Nature has a way of soothing our cares with the loveliness of flowers from MYSTICAL GARDENS! Whatever the occasion, let one of our talented designers create a beautiful fresh or silk arrangement that’s custom-made just for you! We offer everyday and specialty designs that are appropriate for all occasions, birthdays, anniversaries, get well, new baby, sympathy, holidays or just thinking of you. WEDDINGS & SPECIAL EVENTS ~ Whether your wedding or party is formal or casual… a small gathering or the social event of the year… we can help you plan an event that’s a "blooming" success! Call us in advance to schedule a consultation with our wedding coordinator. In addition to floral designing and decorating, we also offer catering and corporate event services. 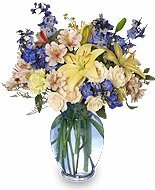 GIFTS FOR ALL OCCASIONS ~ Browse our wonderful green and blooming plant selection for a gift that adds life to any room or office. We also offer a variety of gift ideas, including fruit & gourmet baskets, gift baskets, plush stuffed animals, balloon bouquets, baby gifts, home décor, greeting cards, scented candles, and custom silk arrangements by request. 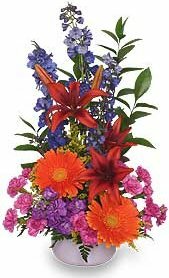 FUNERALS & MEMORIALS ~ Remember, you can also depend on our staff to help you choose funeral flowers for a friend or loved one. Let us create an arrangement that beautifully conveys your feelings of sympathy and serves as a lovely tribute to the deceased.